I had mentioned and posted the recipe of molagai podi in my previous post. I was just wondering to prepare and think about similar recipes which are not only ready to use but also can be used in long run with a good blend of taste and match to the accompanying dish. It was then that my mom suggested about Thengai Podi. I had tasted and ate thengai podi in the past but never made it personally at home. But I was sure that it would good with south Indian breakfast and pancakes like dosa and idlis, since coconut goes very well with coastal side breakfast and also coconut is a coastal ingredient as too. I decided to prepare it and taste them. It really tastes delicious with dosas and Appams. 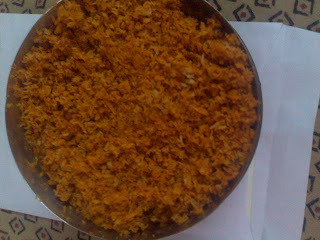 Also, my family gave a thumps up to this thengai podi. Though Thengai podi can be stored for that long like its counter part Molagai podi , it can surely add a god taste to the breakfast as a change. Thengai podi is spicy and little juicy which makes it no less than sukha chutney which are readily available in stores these days. Though it not as long lasting like molagai podi, but it can surely be stored for 3 weeks if kept in air-tight container (keep it in the Refrigerator). 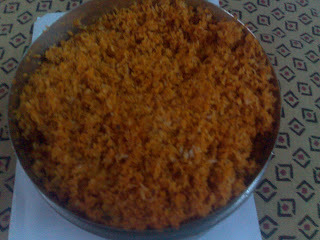 Grate 3 small coconuts and keep them aside. Take a heavy bottomed deep pan or kadai and roast the grated coconut in it till it slightly changes its colour. Note that it doesnt turn too brownish. Roast it till, it appears little yellowish brown. Lower the flame and add Asafoetida and red chilli powder to it and stir well so that it gets mixed properly. Roasted urad dal can be added to this thengai podi , it gives a extra taste to the cuisine and goes well too. Once all the ingredients are mixed properly, which takes just 2 minutes, turn off the flame and allow it to cool for sometime. When cooled, store it a air tight container and keep it in the refrigerator. It will last upto 3 weeks if stored properly. Serves: Goes upto 100 servings. Shelflife: 3 weeks if stored in Refrigerator. Serving Suggestions: Take a spoon of thangai podi and serve it along with dosa or appam or even idli. This recipe doesnt need much of the ingredients but one should roast it properly since, roasting makes it last longer. Roasted Urad dal can be added while stiring the powder, it gives extra taste to the thangai podi. Oh I've never had this before - looks great!